Reach for the sky on flying experience days to suit a wide range of budgets and tastes. If you have always dreamed of flying your own plane then live your dream for a day in charge of the air. Dare to be different with a gift that will thrill with a sense of excitement as the date comes closer. 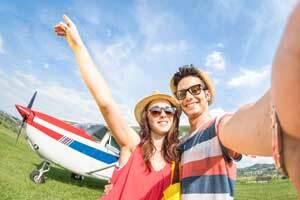 If you have a price in mind then click the flying gift experiences that suit your pocket. From the wings of a light aircraft to a featherweight microlight on flying experience days you can peer down on the awesome aerial view of the countryside. A fully qualified pilot will give you great insight from training right through to taking the controls and will lead you on a journey you will never forget. The only thing is that flying gift experiences are addictive and you will find you want more! A helicopter tour is a much more relaxing affair with an amazing birds eye view of historical sights and the vastness of the earth itself. Old timers really put on a show with step back in time flying experience days in a vintage plane or if you like a taste of speed then nothing will compare to the spitfire journey along the coastline. Propose or celebrate in style with a flamboyant hot air balloon escape as you float into the love clouds with our chosen romantic flying gift experiences. Freefalling together out of a plane is one of the wildest flying experience days making skydiving the number one for thrill seeking action. Don’t miss out on this once in a lifetime opportunity to soar through the skies.